In 2008 Lorrie Bonds-Lopez and her husband joined two China scholars, Rikki and Jeff, for a 3-week hiking/biking touring trip in the southwest of China. First they visited Yangshuo (Guangxi province) and the surrounding countryside for mountain biking and bamboo rafting. Yangshuo is on the Li river and is surrounded by a karst landscape where there are hundreds upon hundreds of limestone hills dotting the countryside. The beautiful scenery here is a common subject of those mystical Chinese paintings as well as the inspiration for poetry. Next was trekking between the guesthouses in the Longsheng Rice Terraces, and then finally to Dali and Lijiaang via train, terminating with trekking in the Tiger Leaping Gorge. 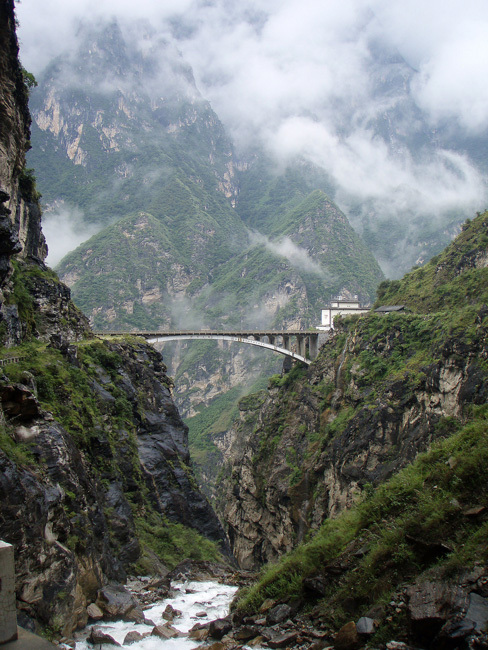 Tiger Leaping Gorge is a contender for the world's deepest river canyon. It is around 15 km in length, and consists of a series of rapids under steep (2000m) cliffs. Legend has it that to escape from a hunter a tiger jumped across the river at the narrowest point (still 25 meters wide), hence the name. The Tiger Leaping Gorge is a canyon carved out by the Yangtze River in the foothills of the Himalayas in Yunnan Province, China. At about 2000 meters deep it is one of the world's deepest river canyons. The white building in the photo is a guest house. From her first wilderness expedition in Dark Canyon in 1970 to rowing an 18� foot raft through the Grand Canyon in 2010, Lorrie Bonds-Lopez has been a wilderness addict. In the 70�s and 80�s she worked as a professional for Outward Bound and in scores of other outdoor education programs delivering 1 to 28 day wilderness experiences involving canyoneering, mountaineering, rafting and kayaking. Her travels include the rivers of Alaska, Canada, and the American West, mountain ranges from Mexico to Canada and the canyons in between. Until her first child was born, most years were spent living out of a backpack and kayak. She went on to raise her children on a diet of rivers and wilderness and now continues pursuits with far-flung trips in Asia and is constantly expanding the checklist of domestic wilderness destinations.